By the most objective measure of all-the record-Jack Nicklaus is the greatest player who ever lived. There was an immensity to Nicklaus’ game. 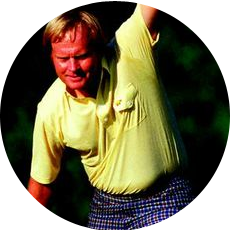 Nicklaus combined tremendous physical ability with boundless mental and psychological resources. At those times when his game was in full song, he would dominate his competition. But Nicklaus’ ultimate genius was that when it wasn’t, he often found a way to win because he would almost never beat himself. His style was a combination of explosive shotmaking and conservative management that calculated all factors-the course, his opponents and how he was playing. As a golfer, Nicklaus was both Secretariat and Einstein.Subjective assessments, however, are secondary because Nicklaus’ record is a colossus that encapsulates the game. In sheer numbers, it is awesome. 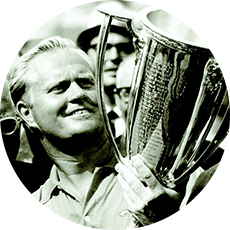 Between 1962 and 1986, Nicklaus won 70 official events on the PGA TOUR, second in total only to Sam Snead. 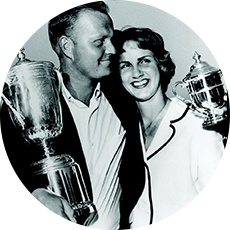 But it is Nicklaus’ performance in major championships alone that sets him above all others. He won 22 U.S. Amateurs, a record six Masters, a record-tying four U.S. Opens, three British Opens and a record-tying five PGA Championships. He completed three full cycles of the modern Grand Slam. If performance in major championships is the ultimate criterion, then no golfer has ever set themselves apart like Nicklaus. "Golf is a better game played downhill." Nicklaus was born Jan. 21, 1940, in Columbus, Ohio. His father, Charlie, was a pharmacist who introduced his son to sports and remained his greatest friend and supporter. While growing up at the Scioto C.C. under the tutelage of Jack Grout, Nicklaus came to idolize Bobby Jones, whose 13 major championships became the reference point for his own career. As an amateur, Nicklaus was clearly a prodigy. He won the 1956 Ohio State Open at age 16. Three years later, he defeated Charlie Coe, 1 up, in an epic final round in the U.S. Amateur and won it again at Pebble Beach in 1961. In between, he tied for second at the 1960 U.S. Open and shot an astounding 269 at Merion in the World Amateur Team Championship. By the time Nicklaus came on the pro scene in 1962, he was a stout, crewcut dynamo of 215 pounds who was about to change the game. With a mighty upright swing that allowed him to hit the ball high and generally with a slight fade, Nicklaus became the longest controlled driver in the game’s history, as well as the most devastating long-iron player. His technique and strength also allowed him to escape from high grass with more power and control than his rivals. Along with a reliable putting touch that was particularly consistent inside of six feet, Nicklaus’ arsenal was designed to conquer the narrow fairways, deep rough and firm, fast greens that characterize major championships. By 1967, he had won seven of them. Between 1970 and 1975, leaner and more fashionably coiffed, he won seven more. Jack Nicklaus is the oldest winner in Masters Tournament history (46). 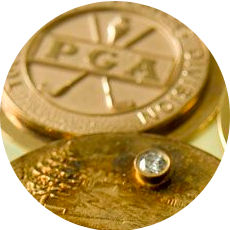 On the PGA TOUR, Nicklaus led the money list eight times, twice while playing only 16 events. Between 1962 and 1979, he finished in the top 10 in 243 of the 357 official events he played in, a rate of 68 percent. For all his physical gifts, it was Nicklaus’ ability to concentrate and gather himself for decisive moments that most separated him. This was never more evident than in his most fulfilling triumph, the 1986 Masters, where, at the age of 46, Nicklaus put together a final-round 65 that included a 30 on the back nine to win by one. Through it all, Nicklaus completed the ultimate champion’s profile by being a gracious loser. He finished second 19 times in majors, but always gave credit to the winner. Win or lose, Jack Nicklaus was the greatest.